Want to learn more about copywriting for Facebook Ads? Signup for our newsletter and receive a free access to AdEspresso’s next free webinar with copywriter Ana Gotter. Ana is a freelance copywriter and content marketer who has been writing for AdEspresso for over three years. She specializes in PPC copy, and has seen how a change in ad text can take an ad from $12 per click to $1.29 per click. 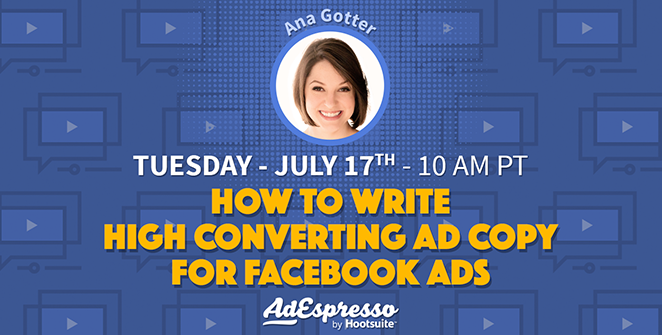 In this webinar, Ana will take you step-by-step through the process of how to write great copy for your Facebook Ads, incorporating strategies like selling techniques and storytelling to help your ads stand out. The end result will be ads that your audience is actually excited to click, so sign up for the webinar today!